By far the most specious animal group on the planet, beetle diversity is a marvel of evolutionary diversification. With this diversity comes a diversity of diets, and beetles that eat commercially important crops and trees pose a serious challenge to farmers and foresters. Moreover, beetle populations are shifting their distributions in response to contemporary climate change, threatening new geographic areas and new plant species. We are applying landscape genomic tools in combination with ecophysiological studies to better understand how these shifts occur, and to develop predictive models. We are currently working on three systems. Mountain Pine Beetle, Dendroctonus ponderosae (MPB), is an eruptive pest of various pine species in North America. Beetles ‘girdle’ and kill trees in coordinated attacks, and local population explosions can cause massive tree die-offs with multi-million dollar impacts on the timber industry. Very recently, northern range limits in British Columbia have started to expand as average winter minimum temperatures increase above the lethal limits of the beetle. This contemporary shift appears to mirrored in the phylogeography of post-glacial range expansion along the spine of the Sierra Nevada and Rocky Mountain ranges. We are employing genome-wide sequencing and QTL studies to model dispersal and gene flow and to understand the adaptive dynamics of important adaptive traits such as development time. This is a collaborative project with Barbara Bentz (USDA), Karen Mock (Utah State U. ), Mike Pfrender (Notre Dame) and Ryan Bracewell (Montana). 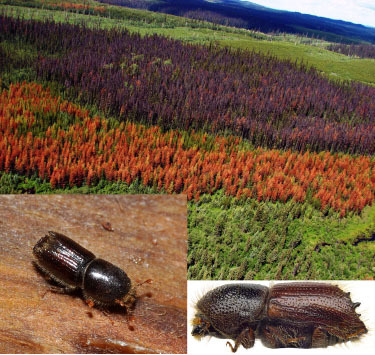 Beetle damage, Mountain Pine Beetle (Left), and Spruce Bark Beetle (Right). The Spruce Bark Beetle, Ips typographus, is a serious pest of European spruce forests, and like MPB has undergone recent range shifts. Unlike MPB, Spruce Bark Beetle populations can be have multiple generations per year in regions where adult reproductive diapause is facultative. Populations on the northern end of the range, however, have a functionally obligate diapause, and thus have only one generation per year. Changes in voltinism, or generations per year, has serious consequences for population dynamics and the probability of outbreaks. We are applying genome-wide sequencing with ecophysiological studies of diapause to determine the genetic basis for facultative diapause and to describe the geographic patterns of variation in candidate genes. This is a collaborative project with Christian Stauffer at the University of Natural Resources and Life Sciences, Vienna.